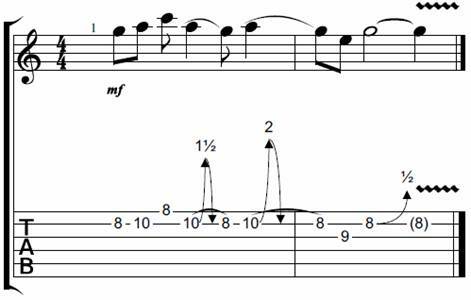 In this article you will learn how to perform emotionally intense string bends like David Gilmour, which serves as an excellent study for blues guitarists that want to develop a more melodic soloing approach. David Gilmour’s playing has been influenced a lot by the early blues guitar players like Clapton and Hendrix. To develop his really recognizable style of playing he combined the blues with a more melodic approach in his soloing. His vibrato and bends are the two things that really characterize his style, as he knows perfectly how long to hold a bend note, when to lower it or when to raise it. In this article we are going to focus on a technique that can be found in a lot of his solos: the overbending technique, a technique that is not easy to master, but can transform an ordinary solo into a great piece of music! Inside the pentatonic minor scale, there are some notes that can be bended over a longer distance than the usual one or two frets. Those bends can sound very intense, and give a lot of color to your solo. This technique was used a lot by David Gilmour, and thus was a part of his sound. If we look at the pentatonic scales in A minor and A major for instance, we can bend notes on the plain strings over a distance of 3 or even 4 frets to reach other notes of the pentatonic major- or minor scale. It is useful to take both minor and major pentatonic scales and compare them next to each other, so you can see which notes are common, and which not. Be aware that this technique is most commonly used on the plain strings (the G string, B string and high E string), because with wound strings, we would have to bend the string over a huge distance to reach a 3-fret distance bended note. But there are plenty of possibilities on the three plain strings inside the pentatonic shapes to experiment with. For example, if we take the E note on the 9th fret of the G string, which is part of the A minor pentatonic scale, and bend it 3 frets (or 1 ½ step), we reach the G note of the minor pentatonic scale. This creates an intense feel, and sounds good over a rock progression! To give an even more emotional feel to these bends you could use the “Guitar Cry Technique”, as described in my free Guitar Cry video lesson. Another great one is to bend the A note on the B string 10th fret over a distance of 3 frets, to reach the C note of the minor scale, and then bend it even further over a distance of 4 frets to the C# note, which is the major 3th of the A scale. It is however important to get the bends in tune. Practice them with a guitar tuner, or just listen to the note you want to reach, and try to get the same pitch while bending. Those bends can sound a bit strange in the first place, but keep in mind that the context where these bends are played in is also important for the overall feel, if you can practice the bends over a good backing track (which is greatly recommended!) they will suddenly make more sense, and create that ‘intense feel’ of overbended strings. Also try to hear the various overbended notes in Gilmour’s soloing, if you do this a lot and listen concentrated, you’ll start to get your own bends easier in tune, because you know how they should sound in your head. The interesting part is that you can bend any string (but remember that the three highest strings of the guitar fit this technique best) over a distance of 3 frets. 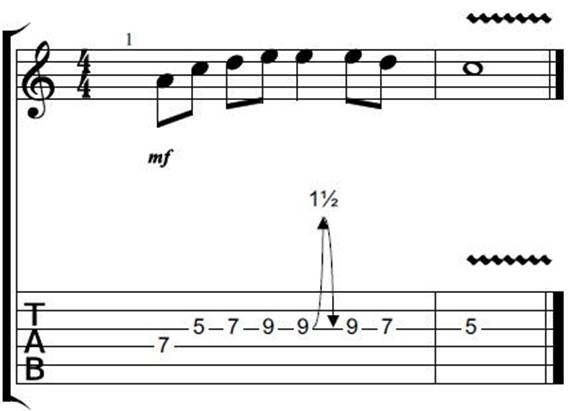 As we’ve looked at in the previous tablature examples, we can even bend over a distance of 4 frets, although this technique is less common. So if you take another look at our minor pentatonic scale you’ll find that every distance of 3 frets can be bridged by using this overbending technique. The same goes for our major pentatonic scale; try to close every gap of 3 frets by bending the string up to the highest of the two notes. When playing blues, one of the most thrilling and recognizable things you can do is combining the notes of the minor pentatonic scale with notes of the major pentatonic scale. However, most beginners run into trouble when trying this because this won’t sound good unless you can apply the right techniques to make the minor and major pentatonic scale “blend together”. One of the many techniques we could use to achieve this are our string bends. As you’ve learned previously, we can bend from any note in these pentatonic patterns above to the next note, but we can also take it one step further and bend from a note in the minor pentatonic scale to a note that’s part of the major pentatonic scale (and vice versa). You could easily try this out for yourself; look at the patterns above and bend any note from one scale pattern (for instance the minor pentatonic one) to the next note in the other scale pattern. Do you know how to make your guitar cry? Learn the number one guitar technique that you need if you want to know how to make your guitar cry.